I love crape myrtle. It makes such a gorgeous tree with it's beautiful flowers and almost weeping shape. 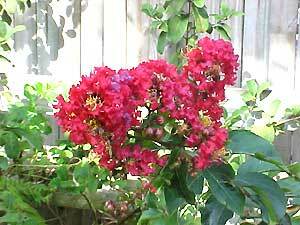 Lagerstroemia indica originated in China and was named after Magnus von Lagerstroem (somehow I don't see a crape or a myrtle in that name, but maybe Magnus's nickname was Myrtle). Crapes can be trained into shrubs or, if allowed to grow, will become small trees. They flower in summer in colors range from pink to red to lavender and do best in sun with regular watering. One of the things that people generally don't notice is the beauty of its trunk particularly as it gets up to about 8-10 feet tall. The trunk is mottled in a variety of grays and reminds me somewhat of a birch tree. Prune as spring approaches trimming up the older branches and either thinning to be more tree like or just removing weak limbs that won't flower. With a little care you will be rewarded with a lovely addition to the landscape. Happy Gardening.